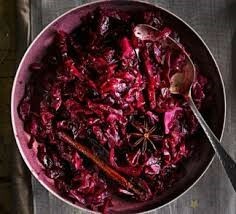 Here is a recipe for Red Cabbage from The Penguin Freezer Cookbook which makes a lot of sense. When I buy red cabbage its always more than I need, I shred it into my salads in small quantities and it is always in danger of getting past its best before I've used it all. As a hot vegetable it takes ages to cook so it make so much sense to cook more than you need and freeze it in smaller quantities.Cooked Red cabbage freezes very well, it doesn't spoil it almost improves! Slice the onion and garlic and cook them very slowly in the fat or olive oil in a large saucepan for about 10 minutes. Add the cabbage, cut into 1/4 -inch slices, and when this has cooked down in the saucepan-after about 15 minutes-add the peeled, cored and sliced apple, the cloves, the wine and a tablespoon or so of sugar. Season and cook gently for about 3 hours. Test for seasoning, and if necessary add more salt or sugar. The dish is now ready to serve or freeze. To freeze, allow to cool, and freeze in waxed cartons. To re-heat: turn the frozen cabbage into a heavy saucepan and gently cook until it is hot all through (which will take 1/2 an hour at least, unless the quantity is small).It may have become a little dry during the freezing, if so add a small quantity of stock.